This bedspread is absolutely perfect for our bed it washes up beautifully and keeps it shape. The red is slightly darker then in the picture. Definitely a must have in any master bedroom. 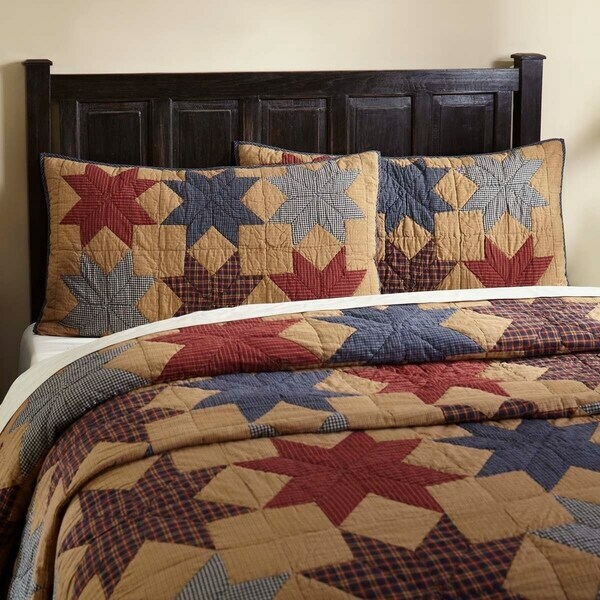 The Kindred Star King Sham blends a mustard plaid base fabric with contrasting 8-point patchwork stars in navy blue and rust red for a truly country trio. Hand quilted; stitch in the ditch; reverses to tan, red, and navy plaid. 100% cotton. Finishes off the bed perfectly with matching quilt. Matches quilt perfectly and has a cute plaid backing with rustic looking, coordinating wooden button closures down the middle of the back. Glad I splurged for these with the matching quilt- finishes off the bed very nicely. Beautifully done. The individual pieces are nicely sewed together. It goes perfectly with the Kindred Star Quilt, of course. It makes for a very smart looking bedroom. I appreciate being able to find matching "king" sized pillow shams so I don't have to use 3 of the full-sized. I ordered the shams when I ordered the gorgeous quilt. To use as accent for quilt.